I'm so jealous, I wish I lived close enough to Polyface to be in a buyer's club. I love lard and have been rendering it for about two years. I store it in pint jars in the freezer and use it for cooking all the time, esp to brown very lean bison and venison and to caramelize onions. I also bake bacon slowly in the over over a rack and save the drippings - great for flavoring braised cabbage and other foods that are enhanced by bacon-y essence. I reserve olive oil mostly for salads and uncooked or lightly cooked foods now. yes lard! yes! Now you can make lard mayo!! The bacon fat mayo reigns supreme, but lard mayo is a very close second! I got a big huge bag of free range grass fed cow fat last summer, not lard, but still renderable and still delicious for cooking with! It's way beetter than coconut for cooking eggs! And greens cooked in lard....Drool! You will NOT be sorry! Good post! I'm hoping to get some leaf lard from the same people we get our milk and eggs from. I've never rendered it before. There's a super recipe for bacon fat mayo in the highly recommended book Fat: An Appreciation of a Misunderstood Ingredient by Jennifer McLagan. Anna and Shamana - I actually have some bacon fat I've been saving in the fridge to make mayo but I just haven't gotten around to it. You've inspired me though! I think I might make it tonight after the food processor comes out of the dishwasher. Nourished Kitchen - I was intimidated by making lard for a really long time, but when I actually just buckled down and made it it was surprisingly easy. You'll love it! Wow, I am SOOO going to try this! Wow that didn't look too hard! I buy lard from the organic meat vendor at the farmers' market. Any idea about making beef tallow? You cooked it too hot for good lard as it appears very dark. 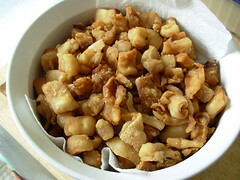 The choice is good cracklings and bad lard or bad lard and good cracklings. When we render lard it comes out nearly clear (and tastes more neutral, giving you more cooking options), but we have no cracklings (as the fat is completely rendered and only slush is left over). 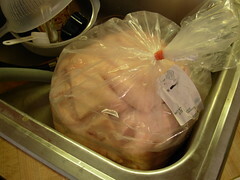 You also don't need to use any water, just start with very low heat and stir regularly. We throw about 20lb into a big steel pot on a flame tamer (on minimum) and stir every 5-10 mins (at first). I just moved to Northern New Mexico and went to the Santa Fe Farmers Market last weekend where I was pleasantly surprised to find leaf lard. Elizabeth, I am SO jealous of you and your sister right now! :) If you're ever in Durham NC, hit me up so we can grab lunch or something. I'd love to talk primal cooking with you! What are you gonna do with all that lard? Lauren, if I'm ever in NC you bet I'll hit you up! Same to you if you ever come to the DC area. 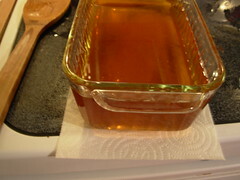 I've used up most this batch of lard just as an all purpose cooking fat. It's hard to break my olive oil habit though! Thanks for the detailed instructions. 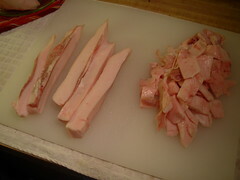 I'm doing this next weekend with some pork fat I got. Woohoo! I have never tried this on my own. I think I'll try to shoot it, but I don't think it will be as good as your picture! How can I make lard mayonnaise, if lard is solid at room temperature? I've made very stiff mayo (the way I like it) with vegetable oil, and it definitely had to be a liquid oil so it could be added drop by drop. 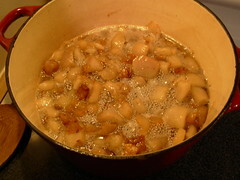 Warm the bacon fat until it is pourable (not hot). The resulting mayonnaise does become very stiff when refrigerated, so either make a very small batch and use it up all at once or let it sit at room temp a few minutes to soften up. I don't know who you are or where you are from, but you might one of my hero's. This is the sexiest blog posting I think I've ever read. Yep. 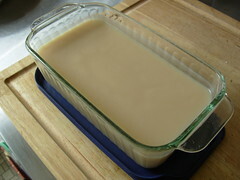 @Tarlach: Seems like a good idea to render leaf lard on the super low heat you are talking about so that you can use it in things like pie crusts where you really want a neutral taste. I would, however, still render on the higher heat for some oil that I was just going to use for frying anyway, and then get me some gooood cracklings! Re: using lard. I want to make enough to last us for about 2 months, so i was going to make a quart. I thought I would make it lacto fermented with kefir whey.I also am concerned about it being rock hard stored in the fridg and I know my husband will not want to wait to build a sandwhich for the mayo to soften enough to spread. I do have about 1/2 cup of duck fat, maybe I should use both? Would that reduce the amount it will solidify? What about a blend of grapeseed oil (bland flavor) and the lard? The lard is free but the duck fat is expensive and hard to find, I have to order it, so the lard and grapeseed oil would be my choice. Suggestions advice, comments, greatly appreciated! OMG! Looks so fattening! but i will still try doing it for the sake of my boyfriend. he loves lard! @Pricille, dietary fat is not fattening. Carbohydrates are fattening. You can eat all the lard you want and if you never eat carbs you will not be fat.